On the 18th of April a direct desendent from of Ghous-al-Azam Shaikh Abdul Qadir Al-Jilani, Shaikh Afeefudeen Al-Jilani, who was guest of honour at the annual Buzme Chishtia Urs Shareef, blessed the students teachers and staff of Darul Uloom Pretoria with his presence. Shaikh performed Salatul Asr at Masjid Sayyiduna Ghouse Azam and after which the program commenced. A recitation of the Holy Qur’aan was rendered by Shakir Ali, a final year student of the institute from Pakistan. Thereafter, Hafiz Furqan Nikoria, also a final year student, rendered praises of the Holy Prophet صلى الله عليه و آله وسلم‎ in the form of Naat Shareef. 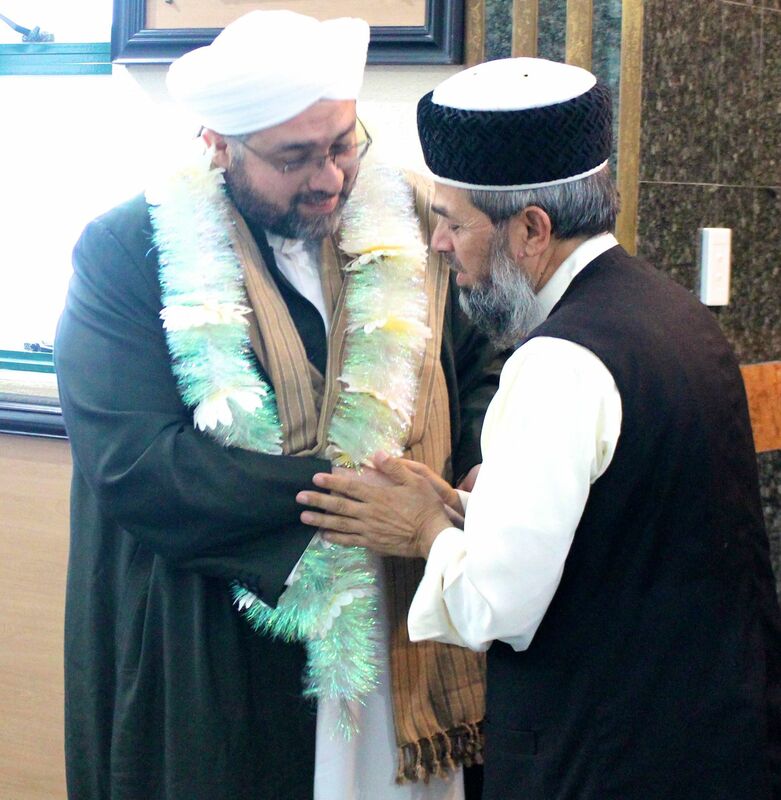 As customary at the Darul Uloom, Shaikh Afeefudeen Al-Jilani was garlanded by the Principal Mufti Mohamed Akbar Hazaravi. The beloved Shaikh, then, advised the students with beautiful words of wisdom. He mentioned that sincerity is of the utmost importance and explained in the light famous narration of Shaik Abdul Qadir Al-Jilani when even in a difficult situation Ghous-al-Azam stuck to the sincere promises he had made to his mother. He said that Shaikh Abdul Qadir Al-Jilani when he went to Baghdad the city known to be a city of knowledgeable people a time came when he was not only known as the leader of the masses but was known as the leader of the Ulama and Awliya. Al-Sheikh Al-Sayyid Afeefuddin Al-Jailani addressed the enthusiastic students of the Institute. He asked a student in the first row as to why he was here, upon which the student replied to seek knowledge and to spread Islam. He then advised the students to learn the Deen Al Islam for the pleasure of Allah almighty and his beloved messenger صلى الله عليه و آله وسلم‎ and not for the sake of name and fame. He said when you do what you do for the sake of Allah, Allah will instill the love for you in the hearts if the people. The program concluded with the Dua of Shaikh Afeefudeen Al-Jilani in which he made Dua for the Darul Uloom, it’s students, teachers and staff. Before he made his way out the students requested for a group photo to be taken so this memorable day could be recorded could always be looked back upon.